The AMWUA Blog marked 100 posts last week. We launched the weekly blog in March 2015 with a post that introduced readers to Tres Rios. This wetlands project on the west edge of Phoenix is home to herons, beavers and bobcats. While the birds and birdwatchers may think the City of Phoenix built it for them, these wetlands also remove nitrogen from wastewater and help to control flooding. Citizens who understand water, where it comes from and how it reaches their homes are more likely to take actions that will help ensure a sustainable supply for the future. It’s all part of living in a desert city. And that brings us to the three goals we had when we started the weekly AMWUA Blog. Make it Readable: Take the mystery out of complex issues about water management, water policy and water conservation. Make it Reliable: Use facts, numbers or statistics from credible sources and credible research so the right information gets to our readers. Make it Useful: Let readers know what it takes to deliver water to their faucets and about helpful city services. Explain to readers how to conserve water and lower their water bills, how to select, install and maintain desert landscaping, and provide a little history on water policy, how it is changing - or how it needs to change. Before we start on our next 100, we were curious about the AMWUA Blog posts that were most popular with our readers. Here are the top five most viewed posts. No. 5: Recycling: Paper, Plastic, And Now Water This tells us we have readers who are eager to understand – and, perhaps, are a little perplexed – about how cities treat and re-use wastewater. The phrase “toilet to tap” often appears in stories about recycling wastewater. While the catchy phrase is irresistible to headline writers, it minimizes an important resource. That’s why we wrote this primer on how cities treat and use wastewater. No. 4: CAP: Tracking The Flow Of Colorado River Water To Your City Our readers are alert to possible shortages of Colorado River water and want to know more. The way Colorado River water reaches the Phoenix and Tucson metropolitan areas is a vague concept for many Arizona residents and prone to misconceptions. That’s why we wrote this question-and-answer explanation of the system that brings the distant river water to your tap. No. 3: Cities Store Water To Keep Taps Flowing Come (No) Rain Or Shine The popularity of this wonky post surprised us. It explains the different ways AMWUA member cities store water underground for the future. It explains such techniques as recharge basins, vadose zone wells, and injection wells. Ok, they are great phrases to use to impress your friends, but this post demonstrates that the cities began planning and investing decades ago to ensure reliable supplies for tomorrow. No. 2: Drought Smart: 6 Things You Can Learn About Water In 6 Minutes For quick, solid answers, this post offers six links to six things you can learn in six minutes that make you smarter about the Greater Phoenix Metropolitan Area’s water supply. It helps you inform others, take action, or simply sleep better. No. 1: Arizona Isn't California: Why We Are Better Prepared For Drought This post explains why Arizona’s populated areas don’t need California’s draconian measures to survive drought. Arizona leaders have had the foresight to make tough decisions to prevent a water crisis. 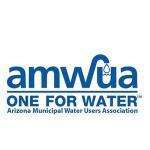 Like most AMWUA Blog posts, this one cautions Arizonans that we are not home free. As desert dwellers, we never will be. We must follow the example of those who led the way by continuing to make difficult choices to ensure water security for our future needs. Well, there you have it. The most viewed AMWUA Blog posts out of our first 100. Next week you’ll meet Warren Tenney, our new Executive Director, who kicks off our next 100.